Welcome Majestic Fast Ferry! Majestic Fast Ferry has joined BusOnlineTicket.com to provide online booking service for their ferry tickets. To celebrate our partnership, we are happy to announce that Majestic Fast Ferry has launched their 2-way ferry ticket promotion between Singapore and Batam. Majestic Fast Ferry is a ferry operator based in Singapore and they are featuring high-speed ferries. Majestic Fast Ferry is committed to making sure passengers have a pleasant and enjoyable journey by providing high quality, reliable and comfortable ferry services. The promotional 2-way ferry services offered by Majestic Fast Ferry are ferry from Singapore to Batam and Batam to Singapore. The boarding point and arrival point in Singapore are located at Harbour Front Ferry Terminal while the boarding point and arrival point in Batam are located at Batam Centre Ferry Terminal. Their discounted 2-way ferry services between Singapore and Batam cost SGD 36.00 (Usual Price: SGD 50.00). Get ready for an unforgettable travel experience in Batam! 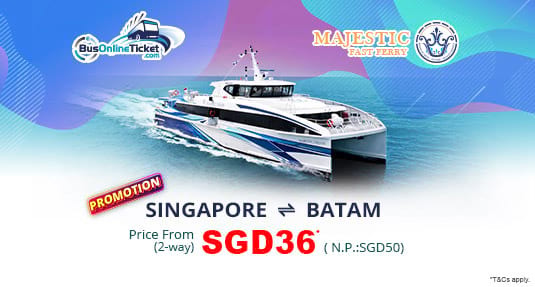 Book Majestic Fast Ferry ferry ticket at BusOnlineTicket.com now and enjoy great savings for your ferry ticket between Singapore and Batam. All bookings made through BusOnlineTicket.com will be instantly confirmed upon payment received.